The official Australian Football League application is naturally one of the best sources of information for anyone planning to take a punt on an upcoming AFL match. It is free to download and provides access to an almost infinite amount of data on the league and its teams. The list includes player profiles, league tables, detailed match analysis by respected journalist and automatic reminders of upcoming AFL matches. There are also video highlights of past games, press conferences and interviews with players and managers. You can keep up-to-date on each game from your phone via real-time stats and scores. Also, there’s a live radio section that lets you listen to audio commentary of each game from a variety of different stations. For a few dollars you can even watch a live stream of all the matches from the regular season and the finals. There are options for weekly, monthly, and season-long subscriptions. The AFL Live Official App is available for both iOS and Android. It can be found in both the iTunes App Store and Google Play. In addition, the latest version of the software supports Apple Watch, so you can get all the content directly from your smartwatch. These is an must-have app for anyone that uses their iPhone or Android for sports betting. SportsBet is the biggest Australia based bookmaker and it is owned one of the leaders in the industry, Paddy Power. Obviously SportsBet puts a great deal of focus on the AFL given the leagues popularity. They offer a wide range of markets for each game, including both traditional money lines and spreads, but also many side bet options. 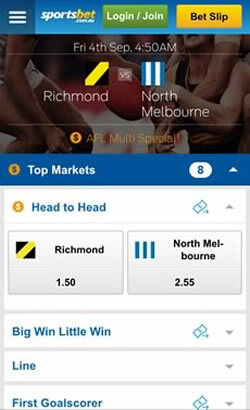 Live betting on the AFL in now available through the app with their new tap and bet feature. SportsBet Mobile gives you access to other important features like live sports streaming, results and tipping. You also get live updates including scores and stats for each NFL game as it happens and you can cash out your bets from your phone or tablet at any point. You can also customize SportsBet mobile to send you updates on specific teams and sports. 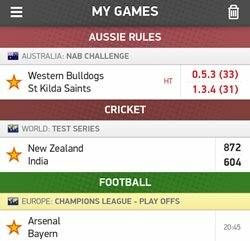 SportsBet run a wide range of Aussie Rules betting specials and offers, all of which are available from the app. Sportsbet Mobile is available for both iOS and Android as a native app that you can download directly to your tablet or smartphone. Users of Windows Phone or BlackBerry devices have access to the equally impressive web-app. ESPN Footytips is the biggest Australian site for tipping competitions on the AFL. There are a wide varity of competitions and some great prize pools that go up to $250,000. You can join various tipping contests or even create your own for just you and your friends or work mates. 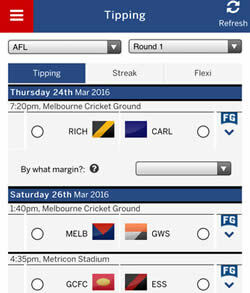 The ESPN Footytips Android and iOS app offer a lot of useful data for any AFL punter. Detailed team statistics, league tables, schedules, injury news, rumours and player profiles are all available. Updates and scores from each match are available instantly. Footytips for Android can be download directly from Google Play. An iOS version is available from the Apple App Store for iPhone and iPad users. Flashscore Australia is one of the most popular and reliable live scores and updates websites. Flashscore cover 7 sports in detailed, including the Australiam Football League (AFL) and National Rugby League (NRL). Flashscore Mobile condenses all the great content from the main website into an easy to use app for both iOS and Android devices. ​What we like about the app is that you can choose a favourite team to get notifications and alerts when important news and information becomes available. Also, you can find AFL team schedules, draws, league tables and lots of other information that average sports bettor will find useful. 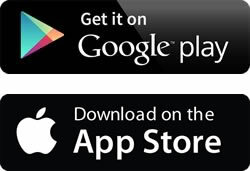 Flashscore mobile can be downloaded from the Australian iOS App Store or alternatively from Google Play. 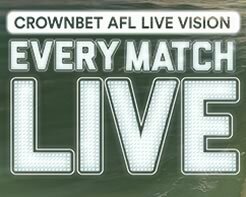 CrownBet is an official partner of the AFL and recently launched their AFL Live Vision service. Customers of CrownBet can now watch any match live directly from their mobile device. Since this is a free service it is the best way to watch live broadcasts of AFL games on your phone or tablet. Live streams start 25 min prior each game and includes both pre and post match analysis. To watch a match, just click on the Watch Now icon and choose from the events available. 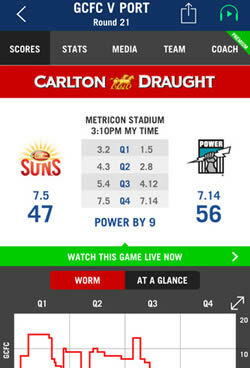 CrownBet also offers useful live stats, updates, and schedule for all upcoming games. CrownBet Mobile also offers advanced wagering options that allow you to place a bet on a wide range of sports from Australia, including football, rugby, tennis, cricket and horse racing. CrownBet Mobile is compatible with any iOS or Android device. iPad and iPhone sports bettors users need to have an Australian iTunes account to download the software. The Australian Football League (AFL) is the most popular competition in the country. It is played under the so-called Australian Rules or Aussie Rules. The sport is similar to traditional rugby, but there are various differences. There are 18 teams in the AFL and the only local state that is not represented is Tasmania. The season consists of a preliminary phase, regular season, and final series for the top 8 teams. The last stage culminates in the AFL Grand Final which is the most popular sporting event in Australia. The winner is awarded the Premiership Cup and Hawthorn is the current holder. Almost all of the clubs have won the AFL at least once, but the most successful clubs are Essendon, Carlton, Collingwood, Hawthorn, Melbourne, and Richmond as all of those have at least 10 trophies. Some of the most popular players in the league include Gary Ablett, Nat Fyfe, Joel Selwood, Lance Franklin, Scott Pendlebury, and Jarrryd Roughead. With an average attendance of around 45,000 people per game and broad TV coverage, it is no surprise that there are lots of Australians betting on the AFL. It is the top sport in the country in terms of gambling revenue and a priority of each bookmaker that offers its services to the local sports bettors. With the rapid development of the mobile technologies it is easier than ever to place a bet and gather important info on the move. Nowadays, you don’t need access to a computer as you can get everything you need on your phone or tablet.